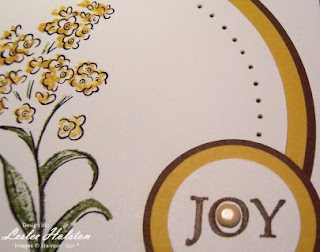 What is "JOY" for you? For me, it's my boys and the time I get to spend with them. My flower beds when they are all weeded and mulched (which they are not). Eating the first harvest from my veggie garden (those beans were good). Seeing God's handiwork in everything around me (I thank HIM each day for it all). Stamping and playing with my new stamping toys and sets. That brings me to this New Catalog Open House card. This card uses just about every toy, I mean tool that I own. I can't call them toys too much....Don will think that I'm actually having fun and then he'll take away my buying privileges (and we can't have that now). I love my tools! They really do make card making and scrap booking much quicker and easier. I used the Big Shot and the small dots plate from Background #1 Texturz plates for the Very Vanilla layer. I wrapped a length of Soft Suede Polka Dot ribbon around that, using the unpolka dotted side (it's like double-sided ribbon--twice the bang for your buck). Then layered it all onto a Soft Suede card base. The large circles were created using the Circle Scissor Plus. It's one of those tools that the more you use it, the better you get. I highly recommend this tool! I can't even cut a circle on a drawn line and make it look nice. I start with the smallest circle (Very Vanilla) and work my way larger (Crushed Curry & Soft Suede). I first stamped my flower image from the Wonderful Watercolors set (it is on the Dormant List this year but is available for purchase). Because this is a 2-step stamping set, I used my Stamp-A-Ma-Jig to get that perfect image placement (outline is in Jet Black StazOn and the second step in Crushed Curry and Old Olive). Then I cut the circle with the Circle Scissor Plus around the image. I wanted the image to be a little off center to allow for the sentiment and embellishing. The sentiment is just the word 'JOY' that I markered in Soft Suede from the saying "JOY is to behold GOD in everything" (also in the Wonderful Watercolors set). 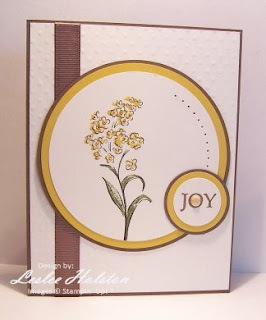 I used the 1" circle, 1-1/4" circle and the 1-3/8" circle punches to create this layered sentiment. I stuck a Saffron brad in the center of the 'O' for added visual dimension. The space above the sentiment and to the right of the image was in need of something. I pulled out my mat pack and paper piercing tool and added the piercing. I followed along a circle of scrap that I had cut (again using the Circle Scissor Plus). I just eyeballed the spacing. I like how the piercing filled in the space but think that perhaps a butterfly popped on a dimensional would look nice too. Yes. I went a little overboard on the tools. But, it was a JOY! What do you think? Take joy in your day today! I hope you've been inspired to break out all of your toys!